Aaron - Florida Bought these for my 2017 FZ-09 "Great fit and performance out of these levers. Wish they were a little cheaper. Regardless, they look way better than stock and adjust to reach. I use two fingers for the clutch lever and one for the brake. 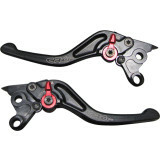 These levers are easy to dial in for perfect fit." Cream - South Jersey Upgrade I needed! "These levers were affordable, easy to install, probably 20 minutes total , and added that style to handlebars required on my 07 R6. I love the functionality and ease of use."